Rohingya families arrive at a UNHCR transit centre near the village of Anjuman Para, Cox’s Bazar, south-east Bangladesh after spending four days stranded at the Myanmar border with some 6,800 refugees. A United Nations-supported humanitarian conference today raised more than $344 million to fund critical relief programmes for Rohingya refugees and host communities in Bangladesh. The exodus – which began in late August – continues unabated, making the crisis the fastest growing refugee emergency in the world today. As of Sunday, some 603,000 refugees are estimated to have arrived in Bangladesh and thousands more reportedly remain stranded in Myanmar without the means to cross the border. “Humanitarian donors have today expressed their solidarity and compassion with the families and communities in need,” said Mark Lowcock, the Under-Secretary-General for Humanitarian Affairs and UN Emergency Relief Coordinator. “These very generous pledges must now quickly translate into life-saving relief for the vulnerable refugees and support to host communities who have been stretched to the limit,” he added. Since the crisis began, UN agencies have ramped up their relief efforts, including conducting a massive immunization campaign that inoculated more than 700,000 people against cholera, as well as providing food assistance to hundreds of thousands of refugees. However, the scale of the crisis has overwhelmed the response, and emergency shelters, blankets, clean water, health care and other forms of aid are urgently needed. Adding to the complexity is that Bangladesh was already hosting about 200,000 Rohingya refugees prior to the crisis. 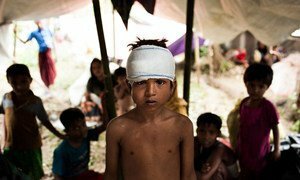 “More than 800,000 stateless Rohingya refugees in Bangladesh aspire to a life that meets their immediate needs for food, medicine, water, and shelter. But beyond that, a life that has hope for the future where their identity is recognised, they are free from discrimination, and are able to return safely to their homes in Myanmar,” said UN High Commissioner for Refugees Filippo Grandi. “As we come together in solidarity, I want to thank Bangladesh and its refugee-hosting communities and the donors for supporting them,” he added. There were a total of 35 pledges made today, including money pledged and committed since 25 August as well as new announcements. Several donors also announced in-kind assistance worth more than $50 million. Fundraising campaigns are also underway in several countries. One such initiative is the UN World Food Programme’s app ShareTheMeal, which launched a worldwide campaign on Sunday to raise funds to feed Rohingya refugee children and provide them with vital nutrition with a simple tap on their phones. The pledging conference was co-organized by the UN Office for the Coordination of Humanitarian Affairs (OCHA), the Office of the UN High Commissioner for Refugees (UNHCR) and the International Organization for Migration (IOM). It was co-hosted by the European Union and the Government of Kuwait. Also speaking today, IOM Director General William Lacy Swing underscored that while sustainable life-saving assistance for the refugee population in Bangladesh needs to be ensured, the root causes of the crisis need to be addressed. “We must urge international leaders to support the peaceful resolution of this decade-long crisis in Myanmar and insist that the authorities create conditions of safety, security and dignity in Rakhine state to one of the world’s most persecuted populations,” he said. Adding that the recommendations of the Rakhine Advisory Commission offer a way forward to peaceful co-existence, Mr. Swing underscored that the implementation must start immediately and that the first step is to allow humanitarians to resume their work in the northern part of Rakhine state.